Snippets of Jack: "I know whose blood you need"
"I know whose blood you need"
Despite his initial hatred towards pirates, William Turner Jr. ends up becoming one. Was this Jack Sparrow's doing or is it his genetic roots? After all, his father, Bootstrap Bill, is a pirate. But Will doesn't learn the truth about his long lost father until he meets Jack. And this is some what of a hard awakening for him. Jack: "I knew him. Probably one of the few who knew him as William Turner. Everyone else just called him Bootstrap or Bootstrap Bill." Will: "Bootstrap?" Jack: "Good man. Good pirate. I swear you look just like him." Can you see the resemblance? Well the fact that Bootstrap Bill is Will's father plays a huge part in the plot of The Pirates of the Caribbean: Curse of the Black Pearl. 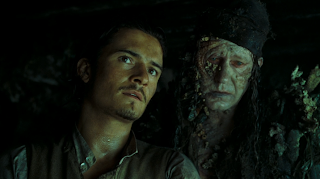 Jack agrees to take Will to save Elizabeth from Barbossa so that he can trade Will in for the Black Pearl. Jack almost does this, except he's awesome of course and manages to get the his ship without selling out one of his best friends. Barbossa needs Will's blood because Bootstrap helped steal the cursed Aztec gold. Pintel: "Never sat well with Bootstrap, what we did to Jack Sparrow. The mutiny and all. He said it wasn't right with the Code. That's why he sent off a piece of the treasure to you, as it were. He said we deserved to be cursed...and remain cursed." Ragetti: "Stupid blighter." Gibbs: "Good man." How nice of Gibbs to stick up for him like that! Pintel: "But as you can imagine that didn't sit too well with the captain." Ragetti: "That didn't sit too well with the captain at all." Of course this brings Ragettie into a giggling fit. Laughing at other people's pain isn't nice, silly pirate. Ragetti: "Tell him what Barbossa did." Pintel: "I'M TELLING THE STORY!" Don't they just get along great? Pintel: "So, what the captain did: he strapped a cannon to Bootstrap's bootstraps (another giggling fit by Ragetti) and last we saw of old Bill Turner, he was sinking to the crushing black oblivion of Davy Jones' locker. Of course, it was only after that we learned we needed his blood to lift the curse." Ragetti: "That's what you call ironic." Ironic indeed. Barbossa gets angry at Bootstrap for extending the curse by sending Will the gold, so throws him to the bottom of the ocean . . . only extending the curse even longer. . . Where is the sense? The crew then has the scramble around trying to find the medallion and the heir of Bootstrap. Barbossa initially thinks that Elizabeth is the daughter of Bootstrap and there for her blood will work so he brings her all the way to the Isla de Muerta only to find that she was lying about her last name. So she runs away off the island with Will and onto the HMS Interceptor as the whole crew argues with Barbossa. As if it wasn't awkward enough with the blood not working, things get even more awkward when they find she's gone. And just when things couldn't get any more surprising, CAPTAINK JACK SPARROW SHOWS UP! Pretty awkward, aye? Considering the tried to kill him and all. Pintel: "YOU! You're suppose to be dead!" Jack: "Am I not?" He then tries to quickly escape. No such luck. Barbossa takes care of this problem though. Barbossa: "Gents, y'all remember Captain Jack Sparrow. Kill him." Such a warm welcoming. But Jack things quickly. Jack: "The girls' blood didn't work, did it?" Even though Jack was knocked out when they found the curse wasn't lifted he still knows these things. This catches Barbossa's attention and he decides not to kill him, yet. Barbossa: "You know whose blood we need." Jack: "I know whose blood you need." And so they set out to find the super hot and awesome William Turner Jr.
why does jack spill his blood at the end? Wasn't only Will's blood needed? To my knowledge Jack didn't spill any blood. In the scenes talked about here in this post, the only blood that was spilled belonged to Elizabeth Swann.